I have been a regular on Kerala State Road Transport Corporation buses ever since I remember. My parents used to stay in Coimbatore at that time, and KSRTC buses were the main operators connecting Coimbatore to Kerala those days. During those days (early and mid-nineties), KSRTC had services only between major points in Kerala, and most other routes were ruled by Private operators. KSRTC's major services were Fast Passengers, Expresses and "Lightning Express" those days. Superfast buses made their appearance in the early 1990s (1992, to be precise). These services were touted to be a faster alternative to the then predominant Fast Passenger Services. Super Fast buses would stop at lesser number of stops compared to Fast Passengers. Super Expresses made their appearance some time in the mid 1990s (I remember seeing such buses back in 1997-98). These buses were faster than Expresses. In the lower "strata", KSRTC buses were largely restricted to Ordinary services. Ordinary buses, those days, were old, tired buses that were downgraded from Fast Passenger or Express services. Ordinary services used to stop at all bus stops and used to run at a painfully slow pace. Routes around Alappuzha district were dominated by such services, those days. The introduction of Limited Stop Ordinary buses came some time in the mid 90s. These services were faster than ordinary buses, but slower than Fast Passenger buses. Now, Limited Stop Ordinary Services (LSOS) are defined as those that had more than one stop per Fare stage (which is usually 2.5 kms long). Sometime in the mid-90s, KSRTC introduced "Town-to-Town" bus service. These were Fast Passenger services, that operated at fixed intervals between two - or more - towns. These buses would stop only at limited number of stops. Call it timing, or sheer luck, these services improved the fortunes of KSRTC. One very "revolutionary" TT (this was how "Town-to-Town" buses were called) service that I remember was between Thrissur and Palakkad. These buses used to cover the distance in a shade under 90 minutes, and Thrissur depot used to deploy their best buses on that route. (This used to happen in the mid-90s). The TT revolution continued across the state, and many more sectors saw the introduction of such services. Ordinary services continued to run on old, unreliable buses, which once were used on highway routes zipping across towns and villages. I remember riding on an ordinary bus which had a blown fuse and did not have lighting. Passengers were seated in the dark, while the conductor managed to issue tickets using a torch. Such buses had long tarpaulin sheets to cover windows in case of a rain, and the bus would leak badly if the rain continued for long time. Even buses that were fortunate to have an intact fuse, would be badly under lit and that used to scare off passengers from these buses. The town-to-town, or TT, revolution got a shot in its arm in late 2005. 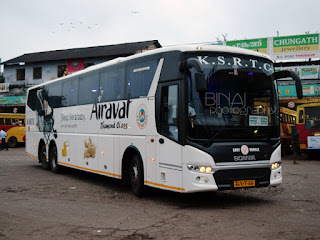 By now, the range of services offered by KSRTC changed to: Ordinary, Limited Stop Ordinary, Fare-Stage Limited Stop Ordinary, Fast Passenger, Limited stop Fast Passenger, Super Fast, Super Express, Super Deluxe, AC Bus and Volvo. The fare difference among each of these classes were in the range of 2 - 10 paise per kilometre. July 2005 saw the introduction of Venad services. Venad buses were branded Limited Stop Ordinary Services. New buses were painted in a catchy white and blue livery, with Venad written on the bus in Orange colour. Venad services were preceded by Ananthapuri Services - introduced in May 2005 - Ananthapuri is the branded for of City Fast buses that operate in Thiruvananthapuram City. This was perhaps the first time that new buses were inducted to operate ordinary services - which was until then a fort of old buses. 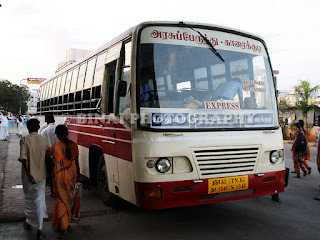 These branded services - Venad and Ananthapuri - had a variety of advantages over normal buses. These buses were painted in distinct liveries, had two doors (compared to only one in normal buses), had better seats and interiors, and a single-piece windshield for the driver. The new branded services improved the patronage for KSRTC in a very impressive way - the buses looked better, and they were well-lit. Venad services revolutionised the age-old TT services. Fast Passenger buses were soon replaced by Ordinary service on TT routes, and these Venad buses started giving private operators a run for their money. The presence of KSRTC buses improved visibly in the southern part of the state. However, the northern part of Kerala continued to remain a fort for private bus operators. KSRTC introduced a couple of Venad buses in this part of Kerala as well. However, Venad was a name typically associated with the southern part of Kerala. Venad buses were renamed as "Malabar" in the later half of 2007. Ananthapuri, Venad and Malabar, together is now reviving the future of KSRTC. From buses which were once called "best avoided", they are now the primary preference of many passengers. 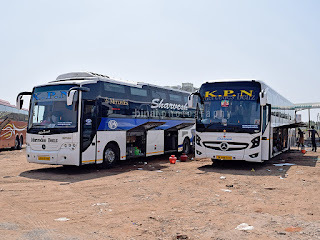 Over the past month, I had been travelling frequently on KSRTC buses, and on every occasion there were lots of passengers waiting patiently for a KSRTC bus, skipping umpteen private buses that came earlier. Now, KSRTC purchases new buses to operate Ordinary services, which itself gives and impression that the corporation is now serious about earning revenue. The KSRTC surely changed its fortunes by giving more care towards the design of buses and passenger comfort. Many routes that never had KSRTC buses earlier, now have buses every 5-15 minutes. The crew are now well-behaved, and are most of the time very decent in behaviour. Earlier, drivers were adament to stop only at stops to pick up passengers. But, now-a-days they are often seen picking up passengers in the middle-of-no-where as well! The old grumpy guys sitting at enquiry counters are now long gone, and replaced with people who now answer to questions in a calm, composed and decent manner! Binai, nice write-up indeed! Good to see that KSRTC in growing in popularity. Me too, whenever I get a chance, prefer the RTC buses to the private ones. And on occasions that I don't get a train ticket to Kerala from Bangalore, I prefer the KSRTC to the bed-bug ridden private buses. I have heard that Kerala RTC is planning to introduce Volvo city buses in Kochi and Trivandrum by this July. Is it true? its very surprise to from site that its an ex-air bus !!!!! this bus now on pala-piravom-eklm route.sometimes on koothatukulam-eklm route. iam very intresting to know that this is on which route on its first-time??????????????????? I checked up the internet and did not find information on the hierarchic of bus services in kerala.Could you put this in a list so that it becomes easy to comprehend? Please forward this to the appropriate authority. Request to start an ORDINARY LS SERVICE from Thrissur to Palakkad via Wadakanchery, Shoranur, Ottappalam at 8pm from Thrissur (to reach Palakkad by 10.30pm.). The same bus can return from Palakkad 3.30am on the same route to reach Thrissur by 6am. I am sure the above service will be financially beneficial to KSRTC.